Glo Pro Teeth Whitening: "Mirror, Mirror On the Wall"
If you will, stop reading this article for a moment and go take a moment to look in the mirror. Were you happy with what you saw? If so then perhaps you should consider purchasing a lottery ticket or making a trip to your nearest casino, as clearly luck is on your side! However, if you found yourself nitpicking and scrutinizing every minute detail of your face, fear not as statistics prove that in a day of social media and pictures galore, concern over one’s physical appearance has never been higher. Fortunately, however there is a great new solution that can provide an improvement the centerpiece of your face; your smile, by using Glo-Pro Teeth Whitening! In recent years, modern dental technology has grown by leaps and bounds, and improved in ways never imagined. Keeping up with the consistent influx of new technology and cosmetic dentistry options can certainly be a challenge for today’s dentists. Although still relatively new, (having only hit the market a few years ago) a groundbreaking new technology for whitening teeth has quickly become one of the most sought-after treatments within the dental profession today. Known as the Guided Light Optic (or GloPro) technology, this revolutionary whitening system is unlike any other to ever produced. The Glo Pro teeth whitening kit consists of an illuminating mouthpiece, an attachable replacement control, charging dock, and g-vial refill accessory. To begin use of the Glo Pro technology, the patient must first fully charge the controller, then apply whitening gel to both the top and bottom rows of teeth. Once complete, you are ready to place the illuminated blue mouthpiece in your mouth for the required eight-minute duration. By repeating this three-step process daily, your results will be a smile that is at least 5 shades whiter than previously seen, thus making your smile brighter than ever! 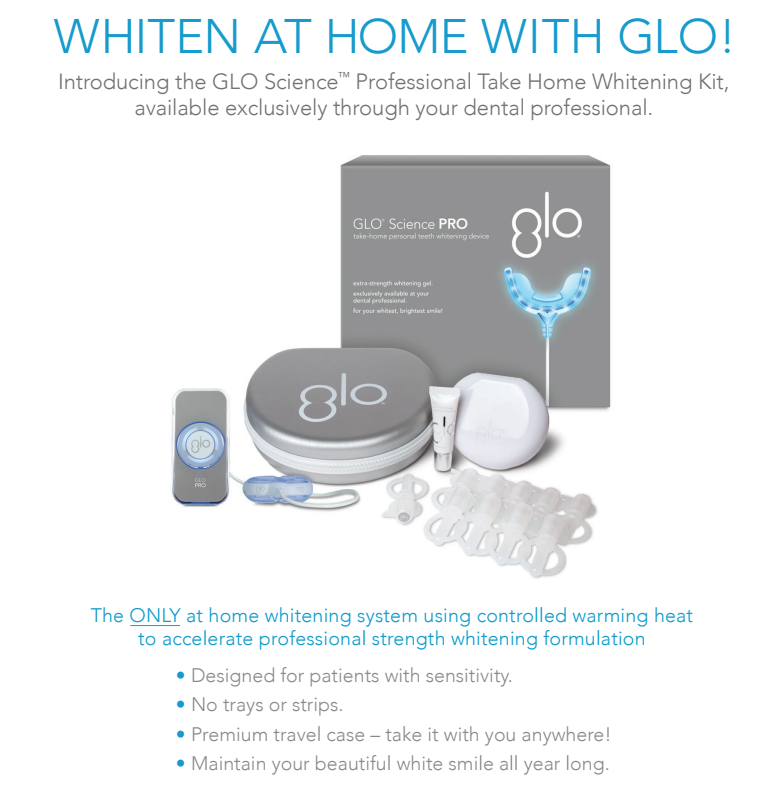 Although the Glo Pro system is a revolutionary new whitening system that has taken the industry by storm, it is certainly not the first whitening system of all time. Basic over-the-counter whitening trays have been a staple of local pharmacies and convenience stories for many years and will likely continue to be so in the foreseeable future. Fortunately, with the science behind the Glo Pro teeth whitening system such hazards are no longer present, and the vast improvement to one’s smile by far exceeds that of its predecessor. Glo Pro Teeth Whitening: Love Your Smile! With the Glo Pro and other countless advances in dental technology, clearly there is much to smile about, and no reason not to smile brightly. If you find yourself dreading looking in the mirror or shying away from the all too frequent photo op, don’t let a smile be the cause! Come see us at Overland Park Dentistry and see if Glo Pro teeth whitening is the answer you’ve been looking for! Dr. Charles R. Kimes, DDS and his expert team at Overland Park Dentistry look forward to having the opportunity to care for you and your family with any preventative, restorative or cosmetic needs you or your family may have. To schedule your dental appointment or whitening consultation with your Overland Park Dentist, contact us at our south Overland Park office at (913) 647-8700 or our north Overland Park office at (913) 341-2380.